In the half-millennium since Thomas More wrote Utopia (1516), a political commentary that considered the characteristics of a fictional republic located on an island, “utopia” has come to mean an idealised state. Our ostensibly post-ideological world, beset by overpopulation, violent conflict, mass refugee movements and climate change seems a long way from any kind of utopian ideal. In Singapore’s golden jubilee year of 2015, the exhibition After Utopia: Revisiting the Ideal in Asian Contemporary Art came at a time of reflection on Singapore’s development as a nation over the preceding half century. The Singapore Art Museum is developing an exemplary collection of Southeast Asian art, in which participating artists come from across the region. Works in After Utopia are from the museum’s collection, exhibited alongside new commissions. Rather than benchmarching the current state of the world against More’s fictional state, the exhibition is grouped into sections based around broad parameters as outlined in the museum’s exhibition guide: “Other Edens,” which surveys the ideal as paradisal garden; “The City and its Discontents,” which considers the urban ideal and a failure to achieve it; “Legacies Left,” which looks at the aftermath of 20th century ideologically driven social planning and nation building; and “The Way Within,” which concerns our psychology, an inner utopia. OzAsia 2017 will present a selection of works from this 2015 exhibition. 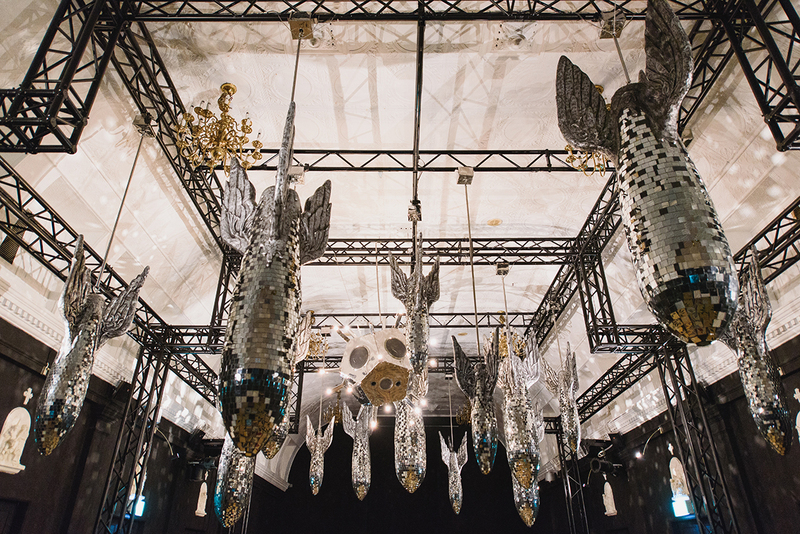 Perhaps the exhibition’s most dramatic work is Filipino artist Kawayan De Guia’s Bomba (2011), comprising 18 mirror balls in the shape of falling bombs — mirror bombs — suspended above viewers’ heads like Damoclean swords, reflecting the fragility of peace and of civilisation itself. This work is newly relevant to the current drama unfolding on the Korean Peninsula and to terrorist bombings in venues such as concert halls. The exhibition guide indicates that “the Tagalog word ‘bomba’ broadly translates as ‘exposed’ and ‘naked,’ stripping bare the true intentions that lie beneath the grandiose words of politicians and world leaders.” Death lurks behind society’s glittering surfaces. 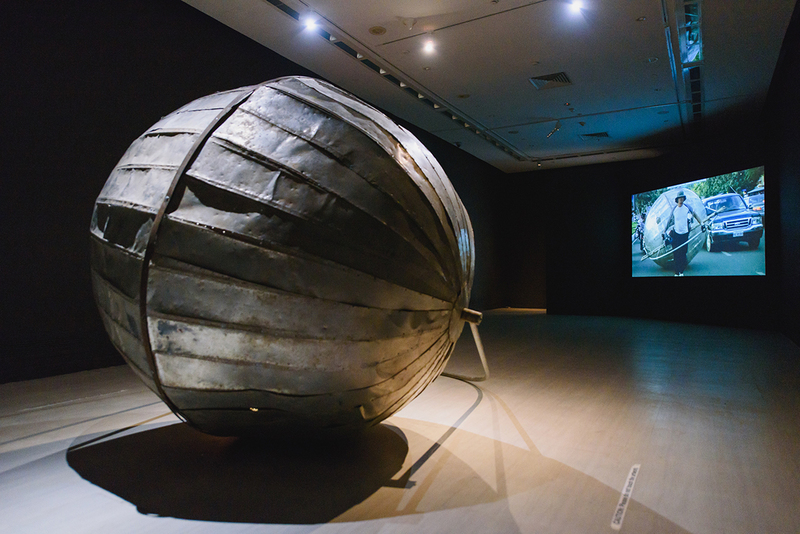 In “The Way Within” section of the exhibition, Cambodian artist Svay Sareth’s Mon Boulet (2011) comprises a video and an 80 kg metal sphere. Drawing attention to the desperate plight of refugees, the former war refugee documents his six-day performance in which he dragged the object from his home in Siem Reap to Phnom Penh. In “The Other Edens,” Filipina Geraldine Javier’s Ella Amo Apasionadamente y Fue Correspondida (For She Loved Fiercely, and She is Well-Loved) (2010) is a painting with assemblage — framed insets of embroidery and preserved butterflies — as if the work is itself a preserved garden, with a female figure, suggesting Eve or possibly a gardener, a naturalist or even the Madonna, pensively examining two young birds. It may be that, as the world’s human population expands and engulfs the planet, gardens and preserved specimens will be all that is left to remind us of nature. 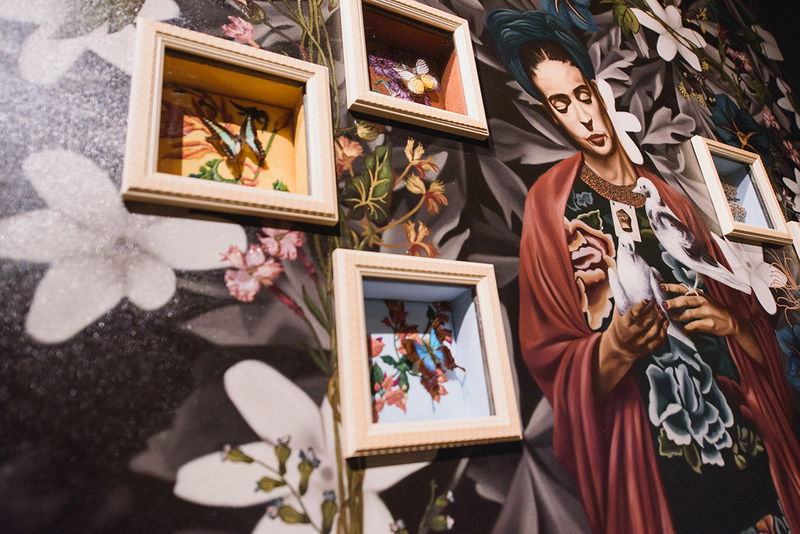 The painting is a self-portrait by the artist, suggesting the difficulties encountered by the female artist in the Philippines, and perhaps positioning women as the thoughtful guardians of nature. “The City and its Discontents” is represented by two artists working with video. Malaysian Chris Chong Chan Fui’s video Block B (2012 -2014) observes city life in the form of high density urban dwellings in Kuala Lumpur that are home to heterogeneous social groups. Shannon Lee Castleman’s Jurong West Street 81 (2008; see an excerpt) is a multi-screen video installation that depicts residents in apartment blocks in Singapore videoing each other’s daily activities and then discussing the process over a meal. It’s a relational artwork that promotes community interaction. As well as revealing the nature of apartment living (80% of Singaporeans live in such apartments), Castleman’s work reflects on the wider issue of privacy subjected to surveillance and voyeurism. In “Legacies Left,” the Vietnamese-American collective Propeller Group’s Television Commercial for Communism (2011-12) is a multi-channel video installation that reveals how a high-profile advertising agency (the one behind Apple’s “Think different” campaign) quite seriously develops a TV commercial to rebrand and advocate communism. In the process, the makers discuss the criteria for a communist society and how an advertisement might be designed to counteract negative perceptions of a contentious ideology. These works starkly contrast with Singaporean Ian Woo’s We Have Crossed the Lake (2009) a painting that suggests the lush foliage of a verdant garden in which we might wish to live. Grouped under “Other Edens,” it is an abstraction rather than a representation, as is the concept of utopia. After Utopia is an eloquent exhibition that draws attention not only to our failure to achieve utopian ideals but also to the Singapore Art Museum’s philosophy of collection which, with this exhibition, indicates growing self-reflection in the region. OzAsia’s audience will be invited to consider the criteria for an ideal society, how well Australia meets them and how they connect us with Southeast Asia. The need for critical self-evaluation has never been greater. Chris Reid visited the Singapore Art Museum courtesy of Culturelink and the Adelaide Festival Centre.